Plans for a manned mission to Mars are on the news just about every other day. But for now, such a manned mission seems impossible. However, Portuguese scientists have brought us one step closer taking people to Mars. One of the main problems when travelling to Mars, and for space travel in general, is fuel. Of course, fuel is absolutely necessary to travel around in space, but it’s also extremely heavy. For example, the fuel that the space shuttle needed was almost 20 times as heavy as the space shuttle itself. And the space shuttles always stayed relatively close to earth. Imagine the fuel a spacecraft flying to Mars, landing there, launching again, and travelling back to earth would need. It’s impossible to build such a rocket, let alone launch it. Because of this, space engineers thought for a long time that it would be impossible to have people return from Mars, making a trip to Mars a lifelong mission. But now, Vasco Gama and his team at the university of Lisbon have made an interesting discovery that could change this. Don't bring it, make it! This discovery has everything to do with the atmosphere of Mars. Martian air contains roughly the same stuff; oxygen, carbon dioxide, nitrogen, as the earth’s atmosphere. The only difference is that the proportions are vastly different. Mars’s atmosphere consists of over 95 percent carbon dioxide, while on earth, that’s just 0,04 percent. Gama and his team have come up with a clever technique to make that high percentage of carbon dioxide on Mars useful. They have found a way to turn carbon dioxide into oxygen and carbon monoxide using a special substance called a plasma. The oxygen can of course be breathed by the astronauts staying on Mars, but it can also be used as rocket fuel, in combination with carbon monoxide. This means that the astronauts can make fuel for their rocket while they are on Mars, so they don’t need to bring it along with them. With this new technique, we can go to Mars with lighter and thus safer rockets, bringing the chances of a manned mission to Mars one step closer. But that’s not everything. On earth, we’re currently facing a great problem in the shape of global warming. This is caused by carbon dioxide emissions, which have greatly raised the amount of carbon dioxide in the air. With this plasma technique discovered by Gama and his team, we might be able to change some of our ‘own’ carbon dioxide into oxygen. However, there are some challenges when it comes to this. For example, the amount of carbon dioxide on earth is way lower than the amount on Mars, making it harder to ‘find’ the molecules in the air. 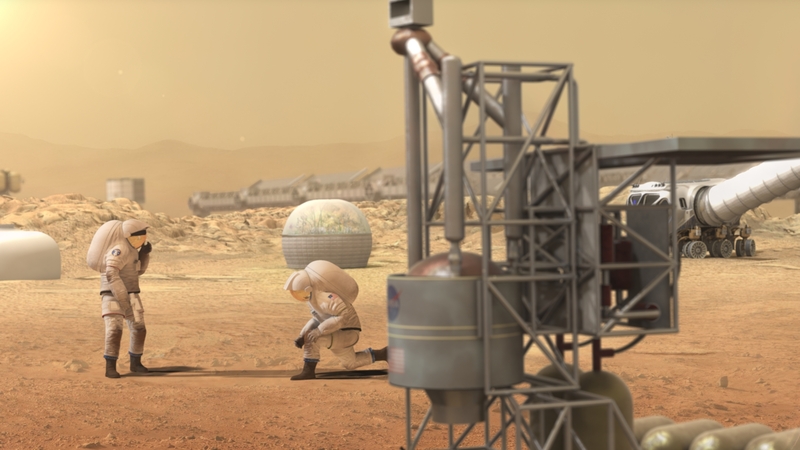 More research has to be done to make this new technique properly useful on both earth and Mars, but the first step has been taken. If you want to read more about astronomy, click here.